Despite the detriment to its work and reputation, the PR industry is still struggling to think differently about how it can diversify its workforce. The PR and comms industry pays great lip service to diversity of the workforce, whether that is on the basis of ethnicity, educational background or where one comes from in the UK. But PRCA census findings, measured against data from the Office for National Statistics (ONS), shows that progress is achingly slow on every front. It could be decades before PR and comms sheds the image of being the preserve of white, middle-class, ‘red-brick’-university-educated people from London and the home counties. So what are the virtues of having a workforce that properly represents the true diversity of modern Britain? Moreover, can this ever be achieved or is it simply an industry pipe dream? An ONS breakdown of UK demographics, based on the nationwide census data from 2011, shows that 87 per cent of the population is white, seven per cent is Asian, three per cent is black, two per cent is mixed race and one per cent identifies itself as being "other ethnic group". According to the last PRCA census, however, which was published in spring 2016, 91 per cent of those surveyed identified as "white British" or "other white", which includes those from America and Europe, while only three per cent identified as "Asian" and two per cent as "black". For comparison, the PRCA admitted at the time of its 2013 census that there had been "little progress" in workforce diversity compared with the 2011 census. Figures showed that 91 per cent of those surveyed identified as "white British" or "other white", while two per cent identified as "Asian", one per cent as "black" and two per cent as "other ethnicity". In five years, then, the industry has managed to increase representation of Asian and black people by only one percentage point apiece, which means both ethnic groups are underrepresented by between one half and a third. The Taylor Bennett Foundation (TBF) works with the industry to increase the number of people from black and minority ethnic backgrounds (BAME) working in PR and comms. Now approaching its 10th year, the organisation has put 24 people per year through its unique training programme, which is sponsored by agencies including Brunswick, Finsbury and MHP, among others. Of nearly 200 trainees, 83 per cent are now working in the industry and 78 per cent have been doing so for at least two years, while the earnings of more than half are higher than the industry average. Sarah Stimson, the TBF’s director, says that, beyond being the right thing to do, the rewards of achieving a more diverse workforce are having an organisation that can outperform its competitors by up to 35 per cent, according to a recent report by management consultants McKinsey. It also opens up potential access to a share of the BAME market, estimated to be worth £300m per year. "If businesses want to tap into that, they have to think differently," adds Stimson. Agencies are not thinking differently, though. Privately, people describe the industry as stuck in the 1980s when it comes to diversity. If the person they hire happens to tick the diversity box, then so much the better, but if it is another middle-class white woman, that is fine too. The PRCA’s apprenticeship scheme and various agency internship programmes all help, but talk is cheap and the reality in the office is rather different from the image the industry projects. One of the big agencies trying to tackle the issue of BAME representation is Golin London, which works with the TBF and the Social Mobility Foundation. The agency has its own ‘Unternship’ programme, which is designed to reach candidates from diverse backgrounds. It says these initiatives have increased the ethnic diversity in its workforce from 8 per cent to 14 per cent, non-white British, in the past year. Bibi Hilton, managing director of Golin London, says: "We believe diversity is critical to creativity and therefore critical to our business. You simply don’t get to great, differentiating ideas if everyone in the team is the same ethnicity, social demographic or gender, or went to the same university. Our clients are not selling their brands, products and services to an homogenous group of people, so an agency needs to reflect that diversity or they will not be able to deliver work that creates real change and business impact." However, the TBF warns that hiring for diversity is only half the battle. Retention relies on an inclusive approach in the workplace. "Diversity can lead to conflict," says Stimson. "One of the reasons there is so much unconscious bias in hiring is that employers most readily understand the background and attitudes of people like themselves, so it’s easier to build teams that trust each other. If you introduce completely different ways of thinking, it increases creativity and challenges ideas, but it can provoke conflict." Hilton admits that managing a diverse team is more time-consuming and demanding, albeit with good business outcomes. "The challenge is building, developing and supporting a diverse team. You need to be flexible and supportive, because you’re not hiring people with the same life goals, experience and perspectives," she says. Cohn & Wolfe, which supports the TBF scheme, reports that 30 per cent of its most recent intake of interns are from ethnic-minority backgrounds, a rise of eight percentage points on the past year. Scott Wilson, UK chief executive of Cohn & Wolfe, is all too aware of the potential pitfalls of failing to take the inclusion step when trying to build a more diverse workforce. "Diversity is a key element of having a talented team and it allows us to be more creative and innovative and to expand the breadth of services we provide to our clients," he says. "If English is not a first language, it is important to ensure communication is open and meaningful. Different backgrounds and experiences can potentially lead to misunderstandings – hence it is important to support a culture that encourages open communication." Of course, employing a representative number of people from BAME backgrounds is only part of the diversity picture. According to the most recent ONS figures, 38 per cent of the population in 2013 were graduates, while 21 per cent were educated to A-level standard and a similar percentage to GCSE level. However, PRCA census figures for 2016 reveal that 64 per cent of those employed in PR hold a degree – nearly double the UK average – while less than 10 per cent are educated to A-level standard or lower, including vocational qualifications. Sources explain that agencies in the financial and corporate sectors still predominantly seek candidates with a 2:1 degree from a red-brick university, while the consumer sector tends to be more open-minded in its hiring strategies. Once again, the PR industry finds itself in the position of being wildly unrepresentative of the very people it is trying to reach on behalf of clients or organisations. But do non-graduates perform as well as graduates, or is employing them just a box-ticking exercise? Anna Terrell, a director at Hope&Glory who runs the agency’s internship programme, argues that they are a valuable commodity. "Audiences are diverse – they aren’t all middle-class twentysomething graduates – and therefore a diverse workforce gives us a much more reflective view on society," she says. "Our school-leaver intern, Lily, is just as capable as any graduate who has walked through the door, but she sees the world through the eyes of a 19-year-old and has a completely different outlook on the work we do. We can’t teach that, and therefore her unique perspective is invaluable to us." According to Hilton, non-graduates also tend to be more engaged with the agency’s brand than their graduate counterparts, while Wilson says that non-grads at Cohn & Wolfe "perform well". In November, Marshall Manson, the UK chief executive of Ogilvy PR, urged staff to "leave their ivory towers" and connect with a Britain outside the M25. About eight million people, or just under 13 per cent of the population, live in London. But with the majority of the biggest UK-based PR agencies having headquarters in London, the industry has a job on its hands of breaking out of a metropolitan bubble of its own making. One agency that has not followed the London-only model is Frank PR. Andrew Bloch, founder of the agency, explains the rationale behind setting up "Manc Frank" in Manchester in 2013 and McFrank, in Glasgow, two years later, in addition to its original London office. Regional diversity, he says, has "reinvigorated" the creativity among staff at the agency. "Creating an agency that has true diversity at its core is the pipe dream of most agencies these days," he adds. "I believe that a better representation of ages, sexes, ethnic, cultural and educational backgrounds in the workforce doesn’t necessarily equal a more diverse agency because of the ‘London bubble’ effect. Basically, any diversity tends to be crushed by the need to conform to a perceived stereotype in the capital. PR people, essentially, are all trying to be the same in London." Cohn & Wolfe, like several other agencies PRWeek spoke to, offers its interns the London Living Wage in a bid to attract new talent, particularly those not already living in the capital. Wilson, while endorsing Manson’s plan to despatch staff on cultural immersion tours of the North, thinks this does not go far enough. The lack of high-quality candidates who are not from London or the South East concerns him. The chief executive, who is originally from the North West, says: "The cost of living is clearly a critical factor here and I am worried that, compared with even five years ago, we are not seeing the same levels of young talent from Scotland, Northern Ireland, Wales, and Northern England. I have no doubt that the talent is there and I am keen to tap into it. Not only do we want to recruit the best talent, wherever it is located, but by increasing geographical diversity even with the UK we will ensure that our campaigns are not built within a London bubble for a London bubble." Despite what agencies claim they are doing, sources tell PRWeek that, although candidates from regional backgrounds stand a reasonable chance of being hired – if they are a blank slate and have never worked in the industry – there is a presumption that staff from regional agencies will not keep pace with their peers in a London shop, limiting their chances of getting a job. If Brexit and the election of Donald Trump in the US teach us anything, it is that surrounding yourself – either in real life or social media – with people who share the same view leads to a nasty shock when you discover that a less-vocal majority holds a radically different point of view. Terrell says it is the job of a good PR agency to understand and reflect this in the work they do. She adds: "Brexit shows that the views of London aren’t always in line with the views across the country – and therefore having a ‘London-only’ perspective would be a disservice to our clients. The work we do simply wouldn’t be as good." So, is the future of diversity in the industry bright? The TBF says there is a long road still to travel before the ideal of a representative workforce is achieved. Stimson concludes: "With commitment from the industry it is achievable, but it will take sustained and determined investment of time and finances from PR firms to make it happen." Nitesh Khetani, 27, a British Indian from London, got his job as a manager at Golin via the Taylor Bennett Foundation’s graduate scheme, after studying at Kingston University. "I was contemplating a career in law, but soon after graduating I changed my mind. A friend introduced me to the Taylor Bennett Foundation (TBF). The programme opened my eyes to an industry I never knew existed and convinced me that a career in communications was viable. I didn’t have any pre-conceptions of the industry because I didn’t know it existed. I always thought PR was about promoting events, and people luring you into restaurants. Being of Indian descent, it’s common to know about other professions such as law, accountancy and medicine; media and comms as a career is pretty unheard of or not considered a serious job. "After graduating, I found it very difficult to find a job, due to the recession and my lack of experience. A close friend had recommended TBF to me, having completed the training programme herself and begun a PR career. "TBF helped me gain the experience I needed, as well as educating me on the types of roles that are available and the culture of different agencies and in-house companies. "TBF highlighted the diversity challenges within the industry but this did not affect my view negatively nor did it have an impact on my job search. If anything, it made me more determined to land a job in PR and be successful at it. "My ethnicity helps in a number of ways, but mainly it’s the approach I take with media and the content we produce. In relation to the former, I’ve found that just by being myself I can offer something unique. I can also build relationships with people who are also not from traditional backgrounds. "We have a lot of discussions in the office about having ethnic minorities well represented in the digital content we produce, too. "I’ve been fortunate enough to work with a diverse range of people at Golin and have never experienced any drawbacks. The team I work in is made up of 50 per cent BAME and 50 per cent white employees. We have a lot of fun sharing stories about our cultures and traditions. A lot of people have had their eyes opened to stuff they would never have been made aware of." 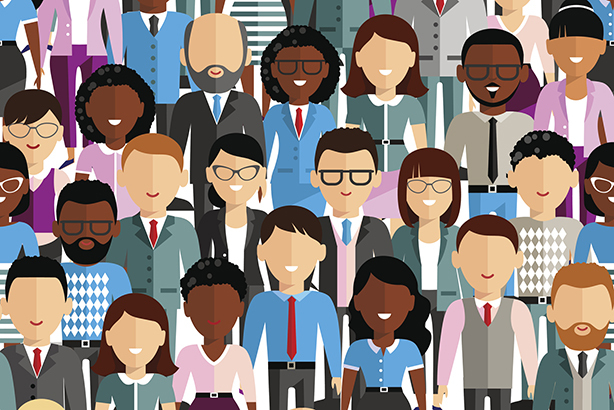 Are client-mandated benchmarks the best way to drive agency diversity?